This floor scale is constructed of heavy gauge tubular stainless steel and features a 24" x 24" platter for plenty of weighing surface. Customize this portable floor scale with your choice of seven different digital weight indicators from the 7000XL digital weight indicator to the intrinsically safe 8000IS indicator. Often we are asked for a portable floor scale system and this is one option that many customers do consider. 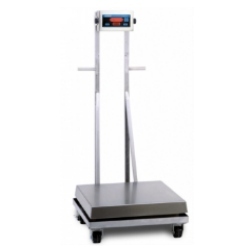 The Doran PFS portable floor scale system can be used with several different types of Doran weight indicators. This floor scale is constructed of heavy gauge tubular stainless steel and features a 24" x 24" platter for plenty of weighing surface. Customize this portable floor scale with your choice of seven different digital weight indicators. From the basic 7000XL digital weight indicator to the intrinsically safe 8000IS indicator, chances are good we have a digital weight indicator to match your specific weighing application. A side load and vertical load protection system using rubber shock mounts prevents load cell sensor damage from impact and overloading. The sturdy, welded tube mild steel frame of the base is designed to withstand the use and abuse of extreme industrial applications. An advanced electronic design prevents damage caused by electrostatic discharge.